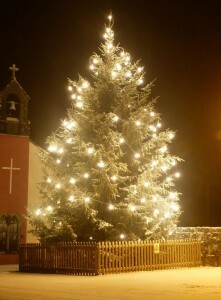 Nothing marks the beginning of the magical holiday season like the lighting of the Christmas Tree beside Kilmurry Church. On Saturday December 10th, 2011, we are going to have our annual tree lighting, and we’ve even lined up a visit from the man himself, Santa! Bring the whole family down for something truly special. We will have gifts, fun, hot drink and singing. At 7.30pm, Santa visits will take place and we will light the tree there after. Full Gallery for Mart Opening Cermony. Santa Turns On The Christmas Lights..